Debating Language: The Role of Culture And Biology (Part 2) : 13.7: Cosmos And Culture Language is a social tool, shaped by cultural values more than fixed biology — so says one linguist whose work in the Amazon stirs controversy. Commentator Barbara J. King explains why this debate about the underpinnings of language makes for good science. A modern "Tower of Babel" stands in Buenos Aires in 2011. 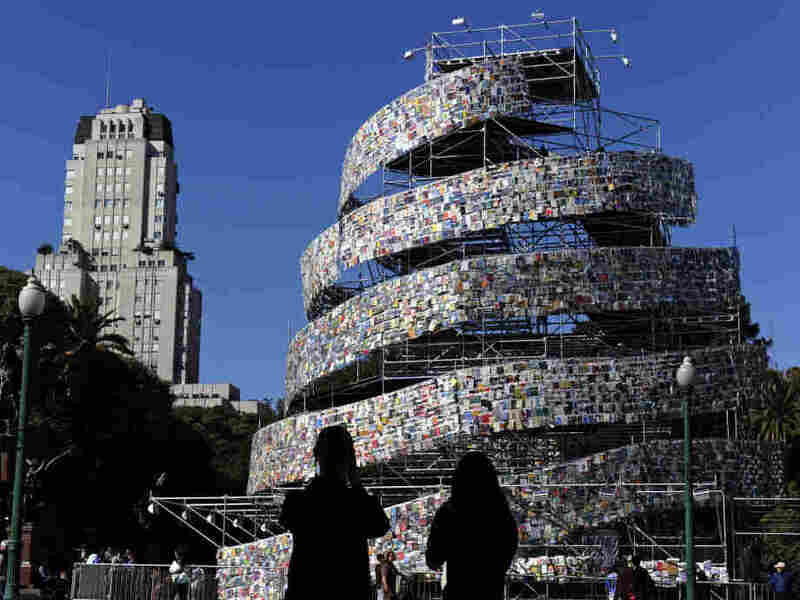 Argentine artist Marta Minujin built the tower out of thousands of books in languages from all over the world. With this formula as shorthand, in his new book Language: The Cultural Tool, linguist Dan Everett argues that the variability in human cultural life explains the variability in human languages. Last week I introduced some of Everett's ideas about language and discussed their genesis in his Brazilian fieldwork. When I suggested that Everett's ideas about culture's forceful impact aid in thinking skeptically about a heavily biological paradigm stemming from the work of Noam Chomsky and colleagues, the response was fast and furious. As I noted in that first post, this is no calm, scholarly debate! People get really riled up about this stuff. Tobias Kroll helped me to see, through multiple informative comments here at 13.7, that, in addition to testable hypotheses and competing data sets, there's much more going on: It's the very nature of language that's contested. Because of different starting assumptions and definitions, including those about recursion, it can be hard for the two (or more) sides to hear each other clearly. So I'll be as clear as I can manage: despite his focus on culture, Everett doesn't ignore biology, as our brains, our genes and our vocal tracts are crucial for our language. He just doesn't accept that human linguistic universals emerge from language genes or brain areas specifically dedicated to language. Everett notes that our species operates via "something akin to an interactional instinct," and concludes, "The instinct to communicate, or interact, precedes language and grammar. It does not explain them." Recursion is central to his discussion. Linguists all recognize the usefulness of recursion such as embedded clauses in sentences, Everett says. It's just that "they do not all accord it the same theoretical importance." For Noam Chomsky, there's no way to produce an utterance without recursion, which is biologically locked into language. For Everett, recursion shows up in language, "when and where a culture desires it, if it does at all." Recursive thinking is crucial in all human groups; recursion in language isn't. For some readers, I was too easy on Everett. Well, I do have some skeptical question marks in the margins of Language, regarding issues both minor and major. Minor: Everett refers to "trained" bonobos who understand symbols, but the apes he refers to learned how to use some symbols by intense interaction with humans and other bonobos in the know. And I don't buy the idea that when we English speakers hear the sentence "I just love that lavender skirt on you," we intuit culturally that both the speaker and the recipient are likely female. Am I the only one to have male friends who would utter that sentence in a heartbeat? Major: Everett attributes to his theoretical opponents ("nativists") claims that I'm not sure they've made in any strong sense. "We may all know how to make a noun phrase," he writes, "but we cannot all write good novels. If these skills are part of language, then the different abilities are not predicted by nativists." Do most nativists really predict uniform linguistic abilities across individuals? That sounds unlikely to me. But I want to dispense with any notion, suggested by some readers, that Everett's core views have been debunked or are unworthy of serious consideration. He's hardly alone in questioning the hard-wired, fixed nature of recursion in human language, for one thing. For another, his books are widely reviewed and his research made the basis of a new televised documentary not only because they are exciting and controversial but also because they are full of solid ideas that are ripe for cross-cultural testing. After many years of working firsthand on Amazonian languages, including Pirahã, Banawá and Wari', Everett is in a good position to offer supporting examples to show that culture shapes language. Last week I explored the Pirahã language in this light. Everett cites other researchers' findings as well as his own in this context. John R. Roberts' work on the Amele language spoken in New Guinea shows that Amele lacks the verb "to give." The culture-based explanation? Giving behavior is so foundational to Amele ways of being that the verb for it is absent. This cultural value is so intensely ingrained in day-to-day life that language is freed from a need to specify it. It's notable also that Everett invites more research on the biology-culture nexus: "I believe that the Pirahãs' lack of counting and their lack of number words are both caused by a cultural taboo against unnecessary generalizations beyond the here and now. This may or may not be correct. Therefore I still lead teams of psychologists and linguists to the Amazon to test not only my own but others' hypotheses about the relationship between language and thought." I find many of the cultural factors cited by Everett and others to be promising explanations for linguistic variability. "Each language is a cognitive tool for its speakers," he writes, "and comes to encode their solutions to the environmental and other problems they face as a culture." This ongoing research-based conversation about language is a genuinely scientific one (unlike, say, any "debate" about whether human beings have evolved over time). A genuine debate on language: scientists shouldn't want it any other way.